As the temperature drops and the snow begins to fall, our hearts all start warming up at the thought of the coming season. With all the hustle and bustle of the holidays who really has the time to spare to fret about their hair? For all of you wonderful ladies out there, here are some easy and glamorous holiday hair styles you can pull together in no time at all, and focus your energy on what really matters most this season. I know what you’re all thinking... really? A MESSY bun? But the messy bun, in my opinion, is a hairstyle that definitely does not get the attention, nor the credibility, it deserves. It’s a simple swept back look that looks fantastic when you have curly hair. To make it look a bit more of a chic holiday hair style, add some accessories. You can either place some nice clips in it, or even go out and get yourself a bow and clip it in right above or below your bun in the back. This gives it a nice holiday feel to it and it takes less than five minutes. The center part is really in this season, so be chic and split your hair down the middle. I know many of your think that the centre part is childish, but it's actually quite charming. It shows off more of your be beautiful face. Especially if you have big, curly hair, it frames your face so well and adds a little bit of that extra something to your appearance. I’ve seen a lot of straight haired girls rocking this holiday hair style, and not nearly enough of all you lovely twirly locked ladies. Half up and half down is simple, easy and chic. Pull the top layer of your hair back behind your head and clip it to keep it in place and let your bottom layers fall down. This one is simple, elegant and adds a touch of class without looking like you’re trying to hard. It takes 30 seconds to do and looks better than half of those over-complicated hair styles out there today. This one is geared toward those of you who have short hair. This one requires a quick trip to the salon, but it’s so worth it because it’s easy to manage and looks great all year round. 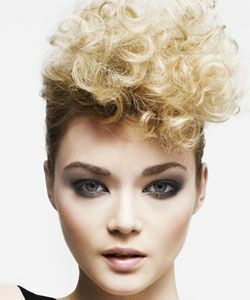 Simply ask the stylist (preferably one who is knowledgable about curly hair) to cut the sides and back short and leaving the top longer and curly. This has an edgy feel to it for all of you wildcats out there, but still looks gorgeous and feminine when worn with a nice blouse or dress. A new year is approaching so why not try a new look? Looking for the perfect winter updo? Let Taren walk you through how to get a protective & stylish curly twist holiday updo! All of these holiday hair styles are simple enough to manage, even if hair isn’t your thing usually. These hairstyles all look good with no matter what outfit you’re planning on wearing out to your holiday parties or even dinner with the family. Now you have one less thing to stress about this season!